It's been a rather tough year for artificial sweeteners. In that time, three new studies have been released suggesting they are poor substitutes for sugar. In the spring, an investigation into their use revealed a disconcerting association with the onset of depression. Then, a long-term analysis of their use revealed they may contribute to overall weight gain. It's been a rather tough year for artificial sweeteners. In that time, three new studies have been released suggesting they are poor substitutes for sugar. In the spring, an investigation into their use revealed a disconcerting association with the onset of depression. Then, a long-term analysis of their use revealed they may contribute to overall weight gain. Last week, a series of experiments in both mice and humans suggested they contribute to the development of chronic diseases such as obesity, diabetes and other metabolic ailments. The compilation of scientific reports to support abstinence from these products does put doctors and dietitians alike in a rather ominous place. For decades, reducing the consumption of sugar has been a major goal to improve health. In place of the natural sweetener, moving to artificial ones offering zero calories has been seen as a valid option. Yet the path appears to have made a significant curve, leaving decision makers with the unenviable position of having to choose the lesser of two evils. The choice might be made easier with the addition of a different perspective. From a microbiological standpoint, the results of these studies, particularly the latter, is not at all surprising. Since the dawn of the human microbiome project, researchers have learned how much our health depends on the nature of the bacteria living in and on our bodies. A balanced diversity comprising of lactic acid bacteria such as Lactobacillus, Bifidobacterium, and the Clostridiales is needed for optimum health. These microbes produce a number of chemicals to not only help digestion, but also improve metabolism and even keep the brain happy. Yet, when this balance is disrupted and these bacteria are reduced in numbers -- a condition known as dysbiosis -- a number of health problems not unlike those seen in the above studies can result. In essence, if the bacteria are treated well, you are happy. If, however, they are treated poorly, they may go away leaving you prone to health problems. 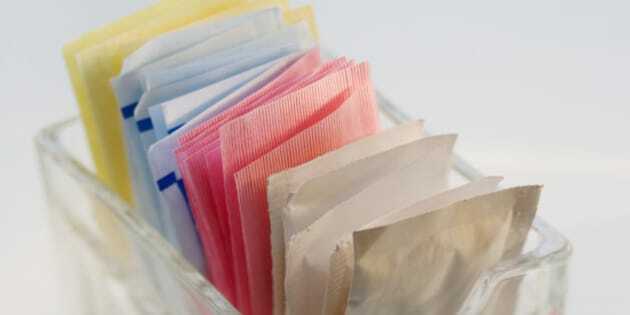 In regards to artificial sweeteners, the problem supposedly lies in the chemistry of the product. While our taste buds might recognize them as being sweet like sugar, bacteria tend to simply see them as useless and even dangerous. As the natural -- not refined -- sugar levels drop in the gut, the lactic acid bacteria end up starving and eventually disappear. As this happens, the population shifts away from balanced to dysbiosis. The body then responds with the development of inflammation and sends signals to the brain there is an imbalance. When this happens, the entire body goes into defensive mode, which includes higher absorption of glucose, increased fat storage and hypertension. In the short term -- such as fighting an infection -- this can be beneficial to aid in the fight; similar high blood glucose levels have been seen in infections such as tuberculosis. Yet, over the long term, this stand at the ready form of inflammation can have significant consequences and lead to the development of several chronic ailments. Though this mechanism of microbial mayhem is well established, the actual evidence to support the contribution of artificial sweeteners has been weak. Last week's article did test the theory in mice as well as humans yet there were confounding issues. The team saw an effect of the big three sweeteners, aspartame, sucralose and saccharin in mice, yet only conducted further experiments with the latter. The group also used significantly high doses of the chemical. While from a microbiological perspective, the results were confirmatory, from a public health perspective, there is room for doubt and even detraction. There is a way forward, however, although it has less to do with the tongue and more to do with the gut. The trillions of bacteria in the intestines rely on sugar to survive and maintain diversity. Yet, the nature of this nutrient can differ; they do not need solely refined sugar. A wide diversity of sweet choices can be sought to not only keep you happy but also to treat your microbes well. Fruits are perfect sources of natural sugars and their juices can sate any taste bud. Extracted natural sugars are also beneficial as they can cure the cravings of a sweet tooth while still providing the bacteria with a healthy diet. Finally, one of the most important sweet foods, honey, has not only been proven to be antidiabetic but also is made by lactic acid bacteria. It could quite possibly be the world's perfect sweet treat. As doctors and dietitians deal with the recent results and decide on a decree of direction, the problems associated with artificial sweeteners -- and of course the consumption of too much refined sugar -- may be easily ameliorated by thinking of your germs. Remember you are not only eating for one; you are eating for up to one hundred trillion. Each of the bacteria in your gut is part of the self and deserves to be treated well. By choosing simple, raw and natural sugars, health can be maintained by supporting a good diversity and encouraging the microbes to treat you as well as your do them.